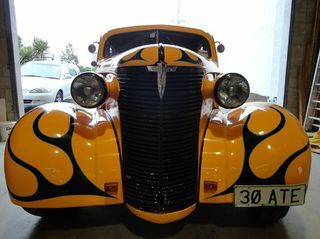 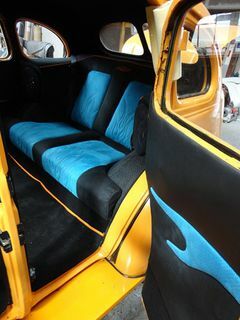 Orange 1938 Chev sedan was re-upholstered by the guys at TAMT. 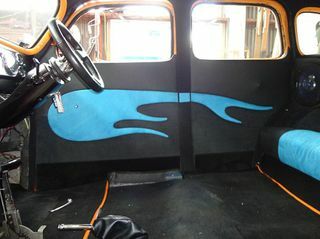 Back seat has been fabricated to rap around the back of the cab and mounted in front of the arm rest cavities are speakers. 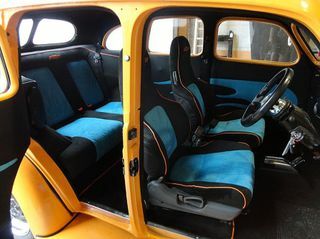 Seats were recovered in blue and black perforated swayed cloth with bright orange piping around the sides of the seats. 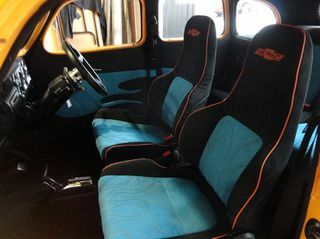 The perforated blue suede inserts had orange stitching in the shape of flames firing up the seat with extra foam in behind to give them that 3d look.